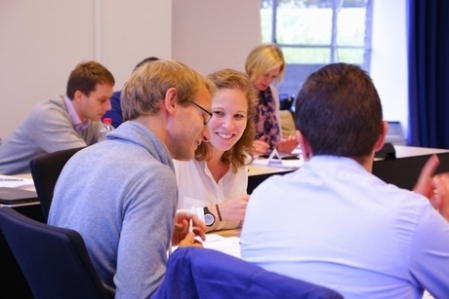 The MaastrichtMBA is a two-years part-time executive MBA programme that focuses on responsible leadership. In this context we actively stimulate you to develop skills to lead yourself, your team and your organisation. By becoming more aware of your personal motivations, values, qualities, weaknesses, leadership views and challenges you gain a deeper and better insight into your own skills and capabilities, which allows you to develop an authentic and responsible leadership style during the course of our programme. Becoming part of our MaastrichtMBA family provides you with a solid guarantee in terms of quality. The MaastrichtMBA is accredited by the leading international quality assurance bodies: AACSB, EQUIS and AMBA. This so-called Triple Crown accreditation confirms the high quality of our research and education, and guarantees an optimal value of your diploma. Only 1% of all business schools worldwide can claim Triple Crown status! Furthermore, we have been accredited by the NVAO, the independent educational accreditation organisation for higher education institutions in the Netherlands and Flanders. An important practical advantage of the NVAO accreditation is that MaastrichtMBA students can get funding through the “Lifelong learning credit“ (Levenlanglerenkrediet). On top of the existing international Triple Crown accreditation, this confirms that our MaastrichtMBA is among the best in the world! In the MaastrichtMBA we take a highly personal approach to learning with Maastricht University’s renowned Problem Based Learning as our leading pedagogy. In small groups we challenge you to interactively acquire knowledge and skills that facilitate reflections on the participants’ diverse work experiences. By sharing and reflecting on these experiences you create meaningful new insights together. The MaastrichtMBA tries to accommodate working professionals in the best way possible. This is why the programme is designed in a modular format with four educational weeks each year, with classes from Monday till Friday. This is why we ask for an average time commitment of 15 to 20 hours per week. This is also why you are allowed to spread your total study load over a minimum of two and a maximum of four years. Maastricht is well-loved for its feeling of intimacy: it’s compact, easy to navigate, and everything is at walking distance. It lies at the heart of a EU-region of 4 million people who live in 3 countries and speak 4 languages. The energy that this generates has resulted in a truly international UniverCity that bursts with creativity, researchers and innovators. Meet Maastricht and you’ll meet Europe, quite literally as well! You can get to Brussels in less than 1 hour, Amsterdam in 2, Paris and Frankfurt in 3, and London in just 4 hours.